Versatile Mass Flow Meter Can measure most steams, liquids and gases without the need to recalibrate. Cost Effective Pressure and temperature integrated into one simple system saving on installation costs and initial capital costs. Range of MV80 Types Available User can choose the most suitable configuration for their application. 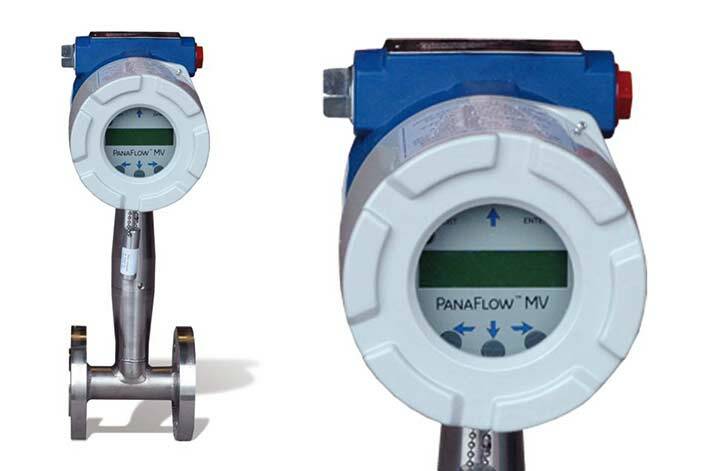 The Panaflow MV80 is an in-line multivariable vortex flow meter, suitable for measuring mass flow, temperature and pressure. Also allows volumetric flow measurement and density. 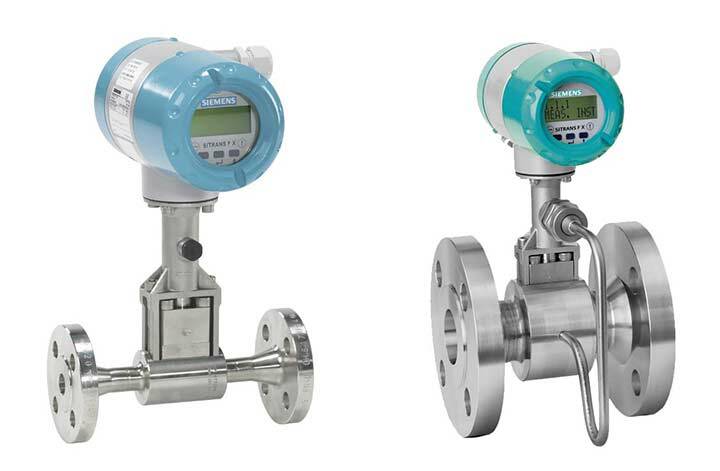 The MV80 mass flow meter can measure most qases, liquids and steam. The in-line mass flow meter's design has a vortex shredding velocity sensor, an RTD temperature sensor and a solid state pressure transducer that measures the mass flow rate of steam, gases and liquids. Most meter types measure temperature and pressure at different points as the devices are not generally installed at the same points This can mean that mass flow readings can be extremely inaccurate. The MV80 measures these parameters at the same location giving more accurate process measurements. The MV80 mass flow meter is very cost effective as it integrates pressure and temperature with a simplified system. This saves on initial capital costs and also installation costs. All parameters can be sent straight to your data acquisition system, so there is no need to purchase additional instrumentation. There are a variety of MV80 vortex meters available so the user can choose the option with the most suitable configuration to suit their application. SITRANS F X vortex flowmeters provide accurate volumetric and mass flow measurement of steam, gases and liquids as an all-in one solution and include integrated pressure and temperature compensation. Is using flow meters easy? Yes, the ordering process is very easy. Orders can be made via purchase order or by credit/debit card. Once we have the paperwork we can delivery next day to any location in Europe. Provided with the equipment is a quick start guide, and if you need extra support, the technical support engineers can be contacted via phone call. Do I get a calibration certificate? Every flow meter is tested upon shipping and return as part of our ISO9001 procedure. Also, as part of this procedure, the flow meter is calibrated once a year. If a copy of the calibration certificate is needed let us know. We are here to help. If the self-help and quick start guides do not help, then call one of our technical support engineers on +44 (0) 1527 882060. We have supplied and supported many clamp on rental installations throughout Europe. How soon can I have the flowmeter? If the stock is permitting, and all paperwork is received by 12pm then flow meters can usually be available the next day. Are the flowmeters PAT tested? Without exception, all our flow meters are tested. If you need a 110v plug instead of the standard 230v plug let us know. Do coatings or paint need to be removed from the pipe? As long as the pipe is relatively clean, coatings or paint is usually not a problem for clamp on flow meters but if the pipe is corroded or the paintwork has bubbled then a quick sanding down with sandpaper or a wire brush is recommended. How do I measure the pipe wall thickness? An ultrasonic wall thickness gauge, that measures to within 0.05mm, is provided as standard with all flow meter rental packages. How do I record data on site? The screendump facility on the integrated dataloggers on all our flow meters, allows you to photograph any screen and download it to your pc.